Synthetic peptide corresponding to Human IP3 receptor aa 1829-1848. Our Abpromise guarantee covers the use of ab5804 in the following tested applications. WB 1/1000. Predicted molecular weight: 314 kDa.Can be blocked with IP3 receptor peptide (ab5839). Staining of IP3R-I in rat cerebellum with ab5804 results in staining of Purkinje cells. Intracellular channel that mediates calcium release from the endoplasmic reticulum following stimulation by inositol 1,4,5-trisphosphate. Defects in ITPR1 are the cause of spinocerebellar ataxia type 15 (SCA15) (SCA15) [MIM:606658]. Spinocerebellar ataxia is a clinically and genetically heterogeneous group of cerebellar disorders. Patients show progressive incoordination of gait and often poor coordination of hands, speech and eye movements, due to degeneration of the cerebellum with variable involvement of the brainstem and spinal cord. SCA15 is an autosomal dominant cerebellar ataxia (ADCA). It is very slow progressing form with a wide range of onset, ranging from childhood to adult. Most patients remain ambulatory. Belongs to the InsP3 receptor family. Phosphorylated by cAMP kinase. Phosphorylation prevents the ligand-induced opening of the calcium channels. Shows immunolocalization of ITPR1 in rat cerebellum using ab5804. 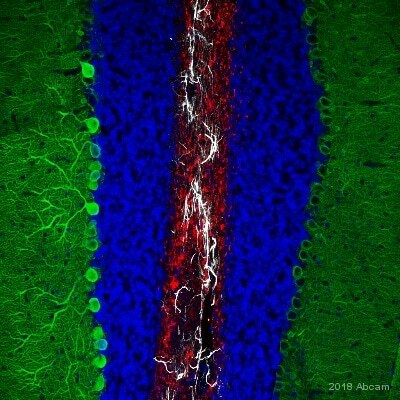 IHC image of ab5804 staining in normal human hippocampus formalin fixed paraffin embedded tissue section, performed on a Leica BondTM system using the standard protocol F. The section was pre-treated using heat mediated antigen retrieval with sodium citrate buffer (pH6, epitope retrieval solution 1) for 20 mins. The section was then incubated with ab5804, 1µg/ml, for 15 mins at room temperature and detected using an HRP conjugated compact polymer system. DAB was used as the chromogen. The section was then counterstained with haematoxylin and mounted with DPX. Publishing research using ab5804? Please let us know so that we can cite the reference in this datasheet. I would recommend to follow the protocol we have on our website. The use of 2 times the concentration of peptide (compared to the antibody concentration) represents a large and sufficient excess to block the antibody. I hope this is helpful. Do not hesitate ton contact me again if you have questions. Thank you very much! The offer is greatly appreciated. When I carry out the work I will fill in the ABreview for you. Hopefully with positive results! Let me know if you need any more details. Many thanks. Thank you for confirming these details and for your cooperation. As agreed, I have issued a free of charge replacement with the order number ******. To check the status of the order please contact our Customer Service team and reference this number. Please note that this free of charge replacement vial is also covered by our Abpromise guarantee. Should you still be experiencing difficulties, or if you have any further questions, please do not hesitate to let us know. I wish you the best of luck with your research. Thank you for confirming these details and for your cooperation. I can confirm that : - the blocking peptide for ab5804 is ab5839 - the immunogen of ab103278 is aa 1155-1184 of the isoform A (SwissProt: Q9NQ66-1) Because we carry over 70,000 products, it isn't feasible for us to keep small sample sizes of our products. I am happy to issue a free of charge unit of each the above products. In order to prevent any shipping error, could you please send me the original order number(s), the date(s) when the order(s) was(were) placed or at least the shipping address? Thank you. Another antibody I have been probing for is the PLCB1 antibody, https://www.abcam.com/Phospholipase-C-beta-1-antibody-ab77743.html. The expected band size is 138kDa. I haven&apos;t received a band at this size - please see attached document. The first three lanes after the ladder are in HEK293T lysate and the next 3 lanes are in bovine retinal lysate. The last 2 lanes are HELA lysate and a negative control respectively, followed by the ladder. As you can see, in my lysate of interest -bovine lysates, there are some very strong bands appearing around 55, 45 and some weaker ones ~35kDa. I was hoping to hear any opinions from you before I try to plan my next run so I can consider how to troubleshoot for this problem. On looking at your troubleshooting guide I have decided to make a few changes - to increase the secondary antibody concentration. I will not increase the primary antibody concentrtion as I am already using a 1/500 dilution which is a lot of my antibody and I incubated for 18hours at 4degrees. I loaded 40, 30 and 20ug of lysate for each of the HEK and bovine lysates. I feel 40ug is quite a lot for it not to show anything and so I&apos;m not so sure increasing the amount will fix things, especially as the bands I am seeing ~55 are already very strong. I will also consider that I have washed the membrane for too long and will reduce my %milk with my antibody to 0.5%. The only other thing I was wondering about is that I notice you do not have any references for this antibody and the picture is from Immunoprecipitation. I it that the protein is lowly expressed and I need to use IP to enhance my signal? One other suggestion has been that my sample could be degraded and so the addition of the 35,45 and 55kDa bands sums up to 138kDa of interest. Could this be correct? 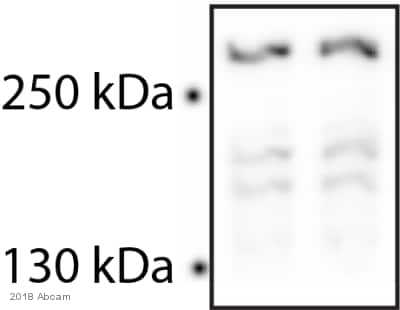 If so, would it be possible that that will happen to only some of the proteins in the membrane as since developping this blot I have stripped and reprobed for a different protein (a much larger prtoein) which didn&apos;t show any signs of degradation. If degradation is a possible explanation, can you suggest how I can prevent this? These samples were very fresh and obtained plenty of protease inhibitors. I hope you can appreciate my million questions in advance of my next experiment as I have very little of this antibody (due to the high concentration used) and so want to consider all my options before wasting it. I would be grateful for any advice/tips/opinions. Many thanks for your help in advance and I look forward to your reply. Thank you very much for your inquiry and your interest in our antibodies. Indeed, we do not have ITPR1 antibodies tested against bovine in our catalogue currently. We are however able to provide you with a testing offer, please see below. In regards to the alignments, I do not have the immunogen sequence of the ab108517 as it is proprietary information of the laboratory from whom we source this antibody. I have however requested the alignment information from them. Please see here below also the alignment of the immunogen sequence of ab97823 with the bovine sequence. The alignment is very good with 93% identity. The alignment of the immunogen of the ab5804 has however 100% identity with the bovine protein, so crossreaction is even more likely. In regards to the blast, I am sorry that I do not really understand the question. I have blasted the immunogen against the human proteins (to have a better overview) and have found only significant reaction with the ITPR1 protein. There are different isoforms, however all from the ITPR1. Please provide me maybe with the relevant sequences. We can provide you also with a testing offer for testing an ITPR1 antibody against bovine. Indeed, even if the immunogen sequence is identical, we do need experimental evidence to be able to guarantee it. Therefore as to our knowledge, ab97823 or ab5804 have not been tested in bovine, I can offer a discount off a future purchase if you buy ab97823 or ab5804 now, test it in bovine and submit feedback to us in the form of an Abreview. It doesn’t matter whether the Abreview is positive or negative, we would just really like to receive your feedback. The discount would be to the value of 1 free primary antibody. This offer might also be applicable to the ab108517, we need however to wait for the alignment results in order to be able to decide on this. If you are interested in this offer, please follow these steps: 1. Reply to this e-mail to let me know that you would like to proceed and test ab97823 or ab5804 in bovine. I will then send a discount code. This code must be issued before purchasing ab97823 or ab5804 so please wait for my reply before ordering. 2. Purchase ab97823 or ab5804 either by phone, fax, or online (www.abcam.com). 3. Test it in bovine. 4. Let us know the results, positive or negative, using our Abreview system (this will take about 10 minutes and images are great if you have them!). To find out more about our Abreview system, please visit: https://www.abcam.com/abreviews. 5. After the review is submitted to us, the discount code becomes active. Simply place your new order by phone, fax, or on the web and mention the discount code. The discount can be redeemed for any primary antibody ordered and the discount code is valid for 4 months after issue. We are always pleased to obtain feedback about our products and any information is greatly appreciated! Even if ab97823 or ab5804 turns out to be unsuitable for bovine, you will still receive the discount on your next purchase after your Abreview has been submitted. Please let me know if you have any questions about this offer and I would be happy to help you further. The Terms and Conditions of this offer can be found at: www.abcam.com/collaborationdiscount.